Raspberry Lemon Meringue Tarts - A Twist on the Classic Lemon Meringue Pie - THE OLIVE BLOGGER - Recipes your family will love! If you are on dessert duty this Easter (or any Holiday really) then you NEED to make these Raspberry Lemon Meringue Tarts! They are the easiest dessert you can make, and will impress even the biggest Lemon Meringue fans in your family. I even added a little extra ingredient to the tarts that is sure to crown you the dessert Queen (or King!). When I think of lemons and desserts I automatically go to pies/tarts, but I really wanted to step it up and give you something fun and new. This is where the raspberry comes in! It is just the right amount of sweet mixed with the tartness of the lemon, and leaves your taste buds singing in happiness! And, it makes these gorgeous tarts even prettier once you bite into them (yes it is possible!). I have loved making pies since I was a teenager, from the homemade crust to the endless fillings, everything about pie makes me happy…but when a Holiday like Easter comes around I always start to stress out about how I will have the time to make the main meal and all the desserts everyone has come to expect from me. That my friends is why I am sharing this super easy, and fast, recipe with you today (hint: you only have to make the meringue from scratch!). Anyways, enough talking, let’s get to those Raspberry Lemon Meringue Tarts shall we?! Raspberry Lemon Meringue Tarts -Easy and Quick! 2 pkg of 12 three inch Tart Shells or you can make your own! Prepare Tart Shells as per the package and allow to cool. Spoon about 1 tsp of raspberry jam into the bottom of each tart. Set oven to 425 degrees Farienheight. In the meantime, prepare Lemon Filling according to package (*Save your egg whites to use for meringue! ), spoon into your cooked tart shells and and set aside while you prepare your meringue. Spoon onto your filled tarts and fluff (see tips below for making it stick!). Bake in the preheated oven for 5-7 minutes, until lightly browned on top. There is nothing wrong with using store bought tart shells and lemon pie filling mix. I repeat, NOTHING WRONG! It is just as tasty as homemade and will save you so much time! 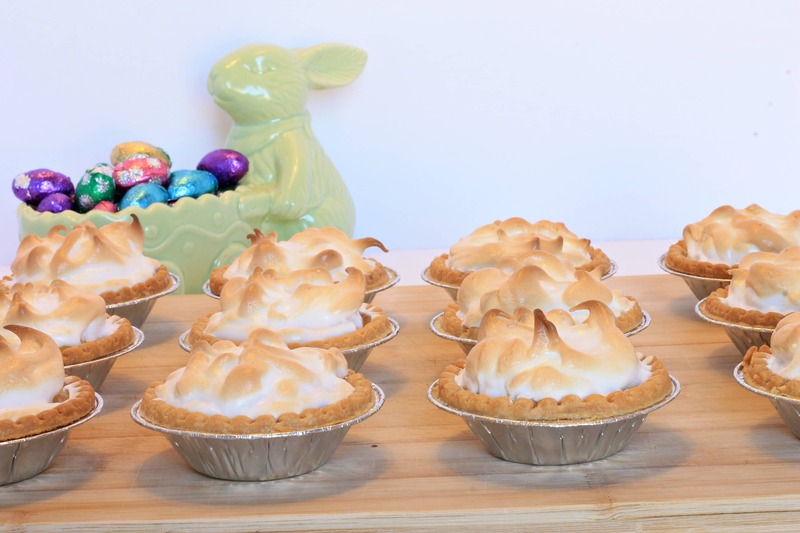 I personally prefer to use Tenderflake 3″ Tart Shells (they are larger than the quiche shells you can buy, which means more Lemon Meringue for you!) and I have been using the Shirriff Lemon Pie Mix for years! You can use your favorite brands, or make your own if you want to go all out. The easiest dessert you can make for Easter! The raspberry preserve adds the right amount of sweetness to this classic Lemon Meringue Tart. Make sure you cook your tart shells until they are lightly golden, you do not want them to be mushy under the lemon meringue, this step is VITAL! The lemon curd should cool slightly before filling your shells, you do not want to put it in right from the stove top (although the package will tell you otherwise!). For the meringue, make sure your egg whites are COLD. In fact, make sure your bowl is cold too! Put it in the fridge for 10 minutes before whisking to make sure it is the right temperature. Before putting your meringue on to your tarts take a small amount and spread on top of the tarts. Using a bamboo skewer (or fork) lightly scrape it into your lemon curd. This helps the meringue stick so it doesn’t fall off when you take a bite! Once you spoon the meringue onto your tarts use the skewer to “fluff” it to get those gorgeous peaks you see above! Keep a close eye on them in the oven, you don’t want to burn the meringue. Thank you for sharing! These look so delicious, I actually am going to email this to my mom. She’s the cook in our family and LOVEs making desserts! That is so sweet!! I hope she enjoys my easy take on this classic recipe! The raspberry is really something special! These look incredible! And what a gorgeous photo! I LOVE Meringue! Especially in tarts! This is such a great recipe I’ll have to give it a try! Thanks Kennedy! The meringue is so light and fluffy atop the tangy lemon tart, just perfect! These look absolutely amazing! I love the twist that you have, raspberries go so well with lemon! Can’t wait to make this! Thank you! I am so happy with how they turned out, this will become a new classic in my home for sure! I love meringue and lemon anything! These look sooooooo good!! They really are tasty! And I definitely won’t judge if you want to have more than 1 ! So yummy! I have to try this! I love simple delicious desserts! Thanks for sharing.